Republicans Running Against Nancy Pelosi? (MIDDLETOWN, CT) April 9, 2018, with updates through June 4, 2018 – Along with many other aspects of campaign advertising, the Wesleyan Media Project has tracked mentions of prominent party leaders in political ads. More specifically, we have tracked references to Obama since 2010, mentions of congressional party leaders since 2012, and in 2016, we added references to both presidential nominees. Our coders also assess whether mentions of these political figures were favorable or unfavorable. 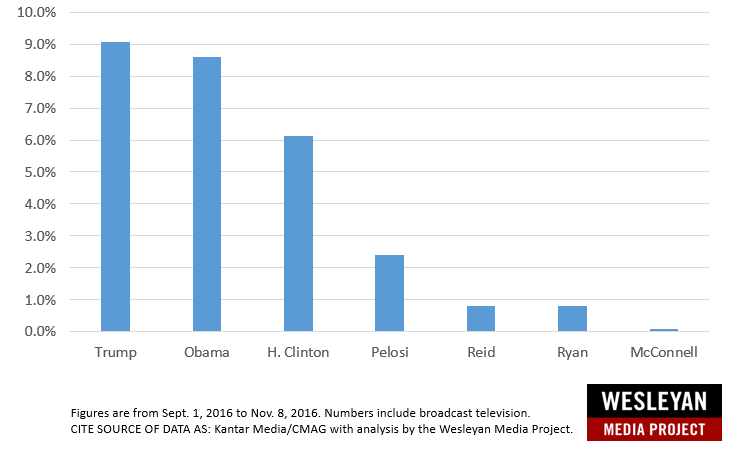 By and large, between 2012 and 2016, congressional leaders were not commonly the focus of unfavorable political ads during the general election phase of the campaign (those airing between September 1 and Election Day). See Figure 1. Obama was much more commonly cited than congressional leaders—and much more often in a disapproving way. 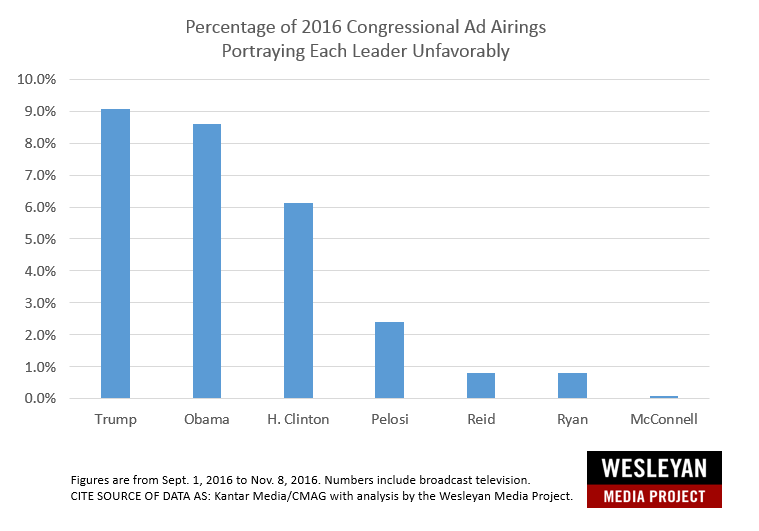 Fifteen percent of congressional ads airing in 2012 cited him disapprovingly (the same percentage as 2010 ads), with only about 1 percent citing him in a supportive way. In 2014, however, the number jumped to nearly 1 in every 4 congressional ads. By 2016, though, this fell to about 1 in every 10 ads. Figures are from Sept. 1 through election day of each cycle. Data visualization work by Kevin McMorrow ’20. Download a summary table of figure data. Running against congressional leaders is much less frequent tactic than running against an incumbent president. Democratic House leader Nancy Pelosi, for example, was referenced in only 3.5 percent of congressional ads in 2012 and in 3.6 percent of ads in 2014. Of the big four congressional leaders, however, Pelosi is the most commonly targeted at a rate much higher rate than any of the other four. Focusing in on 2016, where we also tracked the two major party nominees, Figure 2 shows that unfavorable mentions of Trump actually overtook those of Obama (9.1 percent compared to 8.6 percent), with Clinton running a more distant third with 6.1 percent. In airings for U.S. House and U.S. Senate races between January 1, 2018 and June 4, 2018, unfavorable references to the president continue to outpace unfavorable mentions of congressional leaders. More specifically, Trump is featured unfavorably in nearly 13 percent of the nearly 300,000 televised congressional airings on local broadcast to date. Pelosi continues to be the most targeted congressional leader – featured unfavorably in over 19,000 airings (6.5 percent), primarily from Republicans. Pelosi attacks far outpace the nearly 7,000 unfavorable references to Schumer (2.4 percent, all of whom also target Pelosi) and the mere 1,112 unfavorable mentions of Republican House Speaker Paul Ryan (0.4 percent of all airings) in pro-Democratic ads. Senate Majority Leader Mitch McConnell has received the fewest unfavorable mentions, only 908 airings so far. Interestingly, the third most commonly attacked candidate this cycle is Hillary Clinton, with over 15,000 unfavorable references (5.1 percent of all congressional airings through June 4, 2018). Clinton attacks are nearly as prevalent as Pelosi attacks, and both occur much more frequently than ads attacking Schumer. CORRECTION: A prior version of this report incorrectly reported the start date for the analysis as January 1, 2017, instead of January 1, 2018, which also affected the denominator and some of the figures. This updated post reports numbers for the period 1/1/2018 – 6/4/2018, which is consistent with the narrative released in April with the exception that for the period 1/1/2018 – 4/1/2018, unfavorable references to Schumer slightly outpaced those of Clinton (not the reverse as previously reported). Contact the WMP team at mediaproject@wesleyan.edu if you have additional questions about this report or the correction.